“One of the things that I value very much in Scouting is collaboration. In the days we live in, to exchange with others, to share ideas and to build things together is of crucial importance. Especially, because everyone has something to contribute. This was one of the reasons I enjoyed so much to participate in the recent Europe Eurasia Meeting: to actually see people with no fear of sharing their challenges and successes and to look for ideas, support and useful expertise. During the weekend, 34 participants from 16 NSOs from the two Regions worked hard and openly to establish partnerships they were convinced to be beneficial for the partners involved. 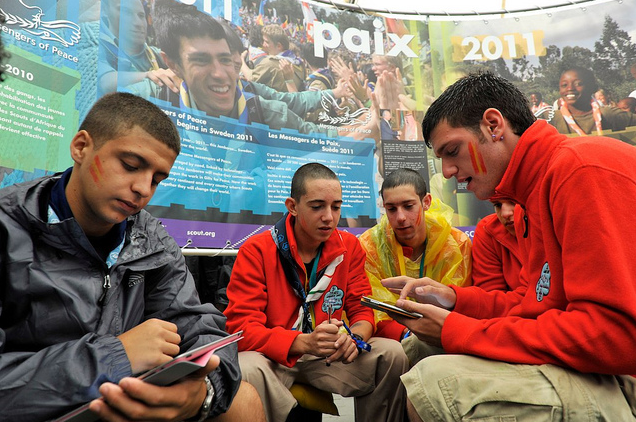 For the Eurasia Scout Region, the participants came from Armenia, Azerbaijan, Belarus, Georgia, Moldova, the Russian Federation and the Ukraine. Scouts from Denmark, Finland, France, Italy, Lithuania, Norway, Poland, Spain and Switzerland attended as members of the European Scout Region. The exercise of mapping needs and strengths of NSOs was particularly helpful in order to understand where each association currently stood. A good number of participants (from both regions) mentioned issues related to Adult Volunteering (including recruitment, management, training systems), programme development for the Rover age section, as well as retention strategies for the 12-18 age range as principal needs in their NSOs. Attending the Meeting as member of the World Scout Committee, I shared our understanding of the concept of Global Support, which was aimed at answering specific needs of NSOs and NSAs, and gave an update on the Messengers of Peace initiative. Rupert comes from Austria and is the Executive Assistant to the Regional Director. His responsibilities include internal and external communications and administrative assistance in Regional events.